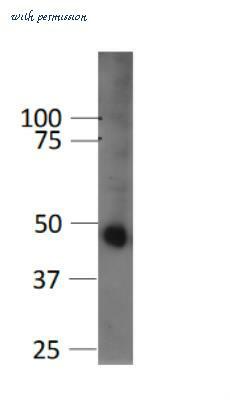 The GSK3B antibody from Proteintech is a rabbit polyclonal antibody to a fusion protein of human GSK3B. This antibody recognizes human,mouse,rat antigen. The GSK3B antibody has been validated for the following applications: ELISA, IF, IHC, IP, WB analysis. The Gsk3b-phos(S389) antibody from Proteintech is a rabbit polyclonal antibody to a peptide of mouse Gsk3b-phos(S389). This antibody recognizes mouse,rat, human antigen. 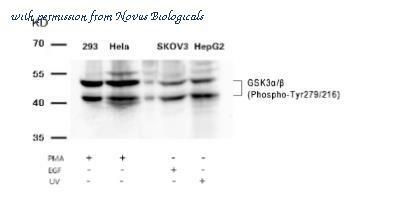 The Gsk3b-phos(S389) antibody has been validated for the following applications: WB, ELISA analysis. 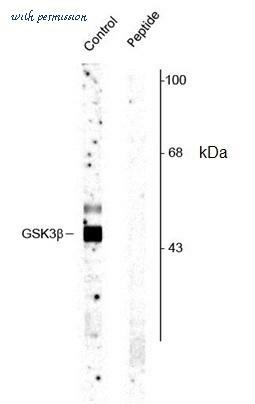 The GSK3B antibody from Proteintech is a rabbit polyclonal antibody to a recombinant protein of human GSK3B. This antibody recognizes human,mouse,rat,pig,zebrafish antigen. The GSK3B antibody has been validated for the following applications: ELISA, WB, IHC, IP analysis. Flow Cytometry: GSK-3 beta Antibody (3D10) [NBP1-47470] - Flow cytometric analysis of Hela cells using GSK3 beta mouse mAb (green) and negative control (purple). 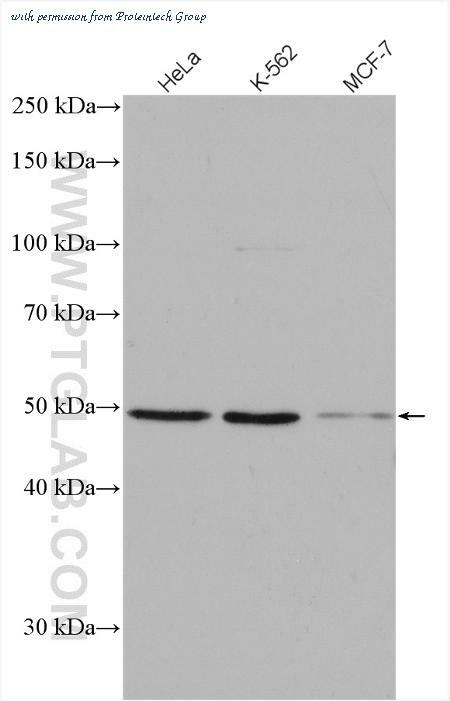 Western Blot: GSK-3 beta Antibody (3D10) [NBP1-47470] - Analysis of GSK-3 beta in mouse beta cell line (betaTC3) using anti-GSK-3 beta antibody. Image from verified customer review. Immunohistochemistry-Paraffin: GSK-3 beta Antibody (3D10) [NBP1-47470] - Immunohistochemical analysis of paraffin-embedded human lung cancer (left) and breast cancer tissues (right) using GSK3 beta mouse mAb with DAB staining. 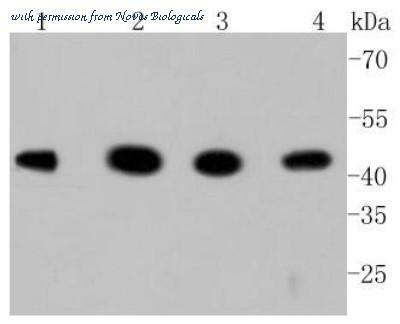 Western Blot: GSK-3 beta [p Tyr216] Antibody [NB100-81946] - Analysis of extracts from 293 cells untreated or treated with PMA using GSK-3 beta (P-Tyr216) antibody. 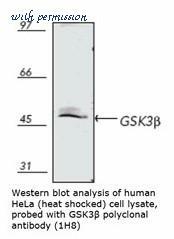 Detection of Human/Mouse/Rat GSK-3 beta by Western Blot. Western blot shows lysates of HT-29 human colon adenocarcinoma cell line and HeLa human cervical epithelial carcinoma cell line. 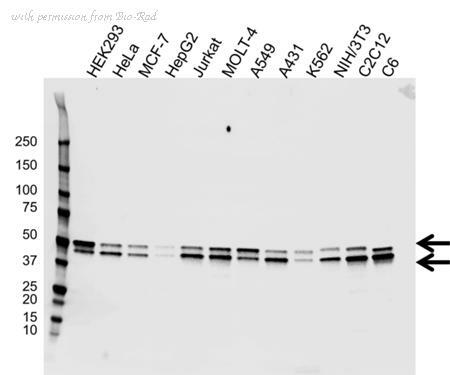 PVDF membrane was probed with 1 ╡g/mL Human/Mouse/Rat GSK-3 beta Monoclonal Antibody (Catalog # MAB2506) followed by HRP-conjugated Anti-Rat IgG Secondary Antibody (Catalog # HAF005 ). For additional reference, recombinant human GSK-3 alpha and Recombinant Human Active GSK-3 beta (Catalog # 2506-KS ) (20 ng/lane) were included. 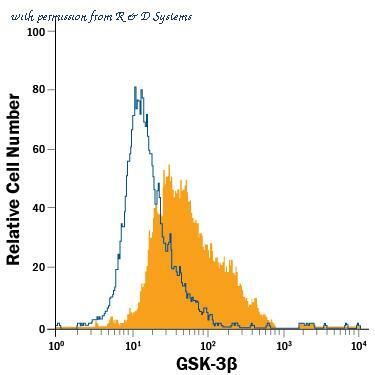 A specific band for GSK-3 beta was detected at approximately 46 kDa (as indicated). This experiment was conducted under reducing conditions and using Immunoblot Buffer Group 1 . Detection of GSK-3 beta in HeLa Human Cell Line by Flow Cytometry. 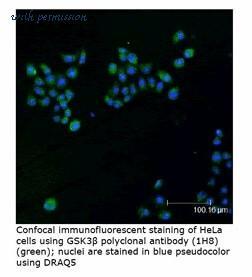 HeLa human cervical epithelial carcinoma cell line was stained with Rat Anti-Human/Mouse/Rat GSK-3 beta Fluorescein-conjugated Monoclonal Antibody (Catalog # IC2506F, filled histogram) or isotype control antibody (Catalog # IC006F, open histogram). To facilitate intracellular staining, cells were fixed with Flow Cytometry Fixation Buffer (Catalog # FC004 ) and permeabilized with Flow Cytometry Permeabilization/Wash Buffer I (Catalog # FC005 ). View our protocol for Staining Intracellular Molecules . 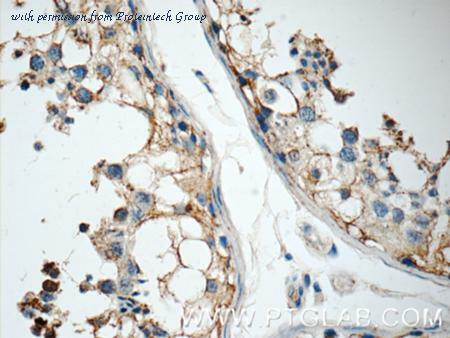 Immunohistochemical analysis of paraffin-embedded human breast carcinoma tissue using GSK3 beta (Phospho-Ser9) Antibody (left) or the same antibody preincubated with blocking peptide (right). Western blot analysis of A549 (lane1), K562 (lane2), PC-12 (lane3), NIH/3T3 (lane4), and HEK293 (lane5) cell lysate using GSK3B antibody. 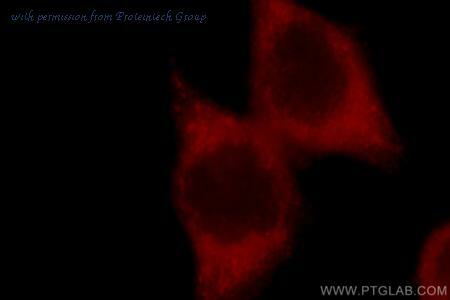 Immunocytochemistry/Immunofluorescence analysis using Rabbit Anti-GSK3beta Polyclonal Antibody (SPC-169). Tissue: Heat Shocked Cervical cancer cell line (HeLa). Species: Human. Fixation: 2% Formaldehyde for 20 min at RT. Primary Antibody: Rabbit Anti-GSK3beta Polyclonal Antibody (SPC-169) at 1:100 for 12 hours at 4°C. Secondary Antibody: R-PE Goat Anti-Rabbit (yellow) at 1:200 for 2 hours at RT. Counterstain: DAPI (blue) nuclear stain at 1:40000 for 2 hours at RT. Localization: Cytoplasm. Nucleus. Magnification: 20x. (A) DAPI (blue) nuclear stain. 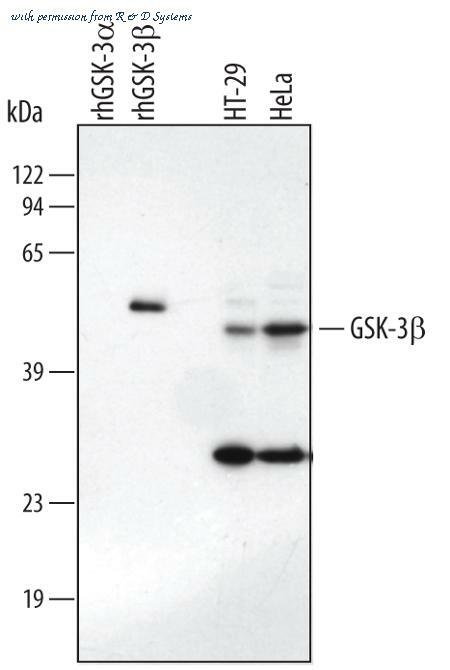 (B) Anti-GSK3beta Antibody. (C) Composite. Heat Shocked at 42°C for 1h. Western blot analysis of GSK3beta pAb. Lane 1: MW marker; Lane 2: HeLa; Lane 3: Jurkat; Lane 4: 3T3; Lane 5: PC-12; Lane 6: MDBK. 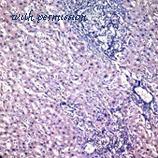 Immunohistochemistry analysis of human hepatoma tissue with GSK3beta pAb. Immunohistochemistry analysis of human skeletal muscle tissue stained with GSK-3beta, pAb at 10µg/ml. Western blot analysis of AY31 cells untreated (co), EGF stimulated (EGF), or pervanadate treated (VH), with GSK3beta (phospho-Ser9) mAb (3A8).